Exeter City boss Paul Tisdale is hoping his side can get their first home draw in the FA Cup for eight years. The Grecians beat eighth-tier side Didcot Town 3-0 on Sunday to win their first FA Cup game since 2009. But City, who lost to non-league Warrington Town last season, have not been drawn at home since they beat Stevenage 4-0 in the 2007 first round. 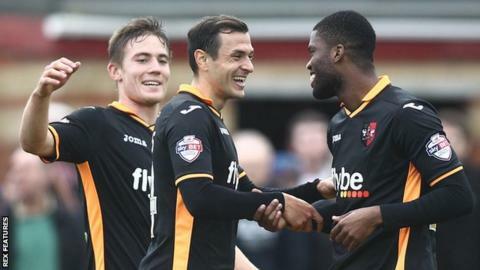 "11 of the last 12 have been away, let's make it a home draw please," Tisdale told BBC Radio Devon. "It's not going to a home draw, it's going to be Bury away, but at least we're in the second round," joked Tisdale, whose side lost at Bury three times in the competition between 2007 and 2012. "We had a lot to lose, I had it all week about people talking about last year and that will always be there," added Tisdale after the win at the Southern League Division One South and West side. "But we had to make sure it didn't happen again. The players had a tone about them that was 'we're not going to let that happen' and I have to say we looked quite edgy in the first half, but in a determined manner. "The players made a conscious decision to take no chances, not to try and look clever, not too try and be too subtle and stand up to them."